this render is real noisy even at SL of 15.
there is only sun coming through opening in the ceiling of this box. No glass in the openings. the verticals are simple red glass from the wizard. I have Direct eand Indirect checked 'on' for Illumination, ref caustics and refracted Caustics. It is had to tell from viewing a finish rendering; we would need to examine the project to determine exactly what might causing noise that is difficult to clear. 1. 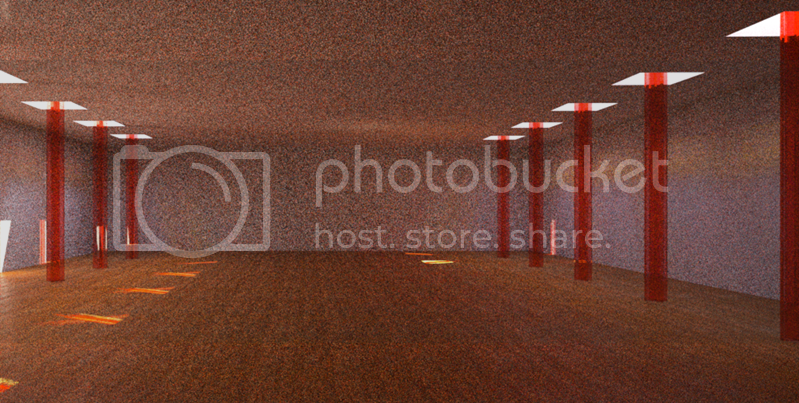 Interior renders often need to go to SL 20 or so to clear most of the noise. 2. The issue is likely the transparent material. Try ghosting those red columns and see if that helps. What does it look like at SL 15 without the columns? 3. If it's the glass, try one of the other glass wizards. Also, make sure you are not using an over-saturated red. Make sure neither the R (likely),G, or B channel value exceeds 225 or so. 4. Use fill lights to clear interior noise faster. all good suggestions. the red is too saturated. I'll do tests. thanks! I`d suggest to place some internal light sources to boost rendering speed. Check this topic. And yes: red glass is too saturated. It is not advised to use more intense colors than 224, 224, 224 as the are not real. Also check if you are not making double transparency by using both glass settings and layer opacity. I jst re-opnened muy old post and amnow adding to it. I am working with AHTOH's suggestions, as well as the Mawell Forum rendering tips, and I was wondering if there is a tool in Maxwell to tell if an object is intersecting with another object. Or should I use a physical sky but (since I don't need sun rays coming in my interior) , just Turn off the sun in the physical sky before rendering. Nota: i need multi-light feature on.